I printed out a copy of the "I Hope You Dance" post with your comments for Miss Darcy. She left a comment there, and I am going to repost it here so everyone who has been waiting for an update can read it. Her amazing spirit comes through in her words. "hi,this is miss darcy. i would first like to thank everyone for all of the well wishes! i especially would like to thank billie for writing about this. i can't tell you how lucky i consider myself to have been able to teach your girls this year! every time i would talk to my mom about how well the class was going and how proud i was of eden and holland, my mom would begin to tear up. it is of no surprise that on the night of the performance there was not a dry eye in the house when the curtain opened on the those 5 little girls. i have taught for 16 years and every now and then i am blessed enough to have moments like that! as far as my health goes... i am doing just fine! :-) i have a lot of work ahead of me, but by this time next year i should be back to normal! i fully intend on starting the dance season again this year as soon as i am on crutches. i will be in a wheelchair for a while and great minds must think alike because i felt the same as eden did when i was told! now i'm just going to have to find some stickers for my wheelchair to try and make it even half as cool as hers is! :-) thank you again to everyone and don't worry, i've already started thinking of ideas for eden's and holland's dance performance for the 2010 recital! we will all dance again! :-)"
Thank you for your comment Darcy. I am so happy to hear that you are doing so well. You are truly an inspiration to me and to my girls and we will continue to keep you in our thoughts. Looking forward to the 2010 dance season! And just in case you need a little boost today...here's a picture guaranteed to make you smile. Miss Darcy must indeed be an incredible person to be in such high spirits so soon after such a devastating injury! I have no doubt that she will be dancing again before you know it. Maybe we could all send her our favorite stickers to help make her wheelchair as cool as Edens?!?! 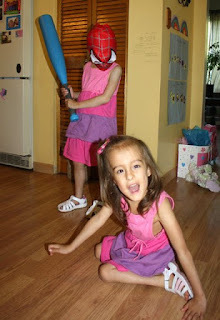 Is Holland wearing a Spiderman mask in that pic? LOL, too funny! LED castors look very cool too, Miss Darcy will need some of those. Check out Bill Shannon's amazing crutch dancing too. Aimee Mullins is awesome too, she's a runner and model with designer prosthetic legs. Thanks for the link to Bill Shannon's video, Claire - that's really cool! And thanks for posting Miss Darcy's response, Billie - I don't have that much positivity when I'm coming off of a great day! I can see what you mean about her being an amazing person. Lastly, (though never leastly), how adorable is that picture! A favorite photograph of mine has 2 friends drying the dishes, one holding the frying pan above the other's head in a classic 'I'll show you!' pose. Something about cartoonish violence (complete with mask) is just perfect. When did Holland get so tall - at first glance I thought it was Marion. So glad things are going well for Miss Darcy, she sounds like a wonderful person. Holland doesn't look like shes going to be friendly to Eden!! So glad for an update on Miss Darcy. So amazing. I hope all the rehab goes well for her. The girls will learn so much more from her than they ever imagined! Happy 5th Birthday Holland and Eden!! !